Howdy Y'all! I am Teresa from Fun in K/1 and the hostess of Teaching Blog Roundup. This time of year I like to sit back and appreciate all I have to be thankful for. Of course I am thankful for God and my wonderful family. I have a job that I love (most days)! All in all, I live a very blessed life and am thankful everyday. As I am writing this post, I also realize how thankful I am that I started blogging. I started off just reading various blogs and learning so much. Then I started my own blog, with the help of Teaching Blog Traffic School. This pushed me to become a better educator and share my best practices. Then, I met so many other amazing teachers and bloggers. When I started Teaching Blog Roundup, I had the pleasure of teaming up with other fantastic bloggers to learn and share even more! It is truly the best form of Professional Development ever! So if you are toying around with the idea of starting a blog, I say definitely go for it! Now with the holidays in full swing, here is a great way for students to add to their projects. 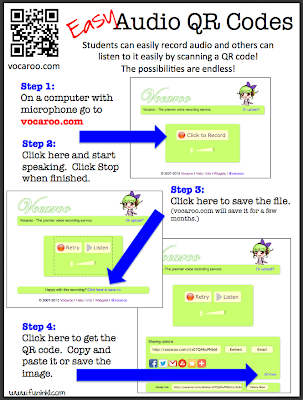 Capture your students audio recordings with Voice QR Codes. It is so easy to do. Click here to download these directions. Teaching Vocabulary... Making Words Stick! Starting to think ahead to the holidays . . .